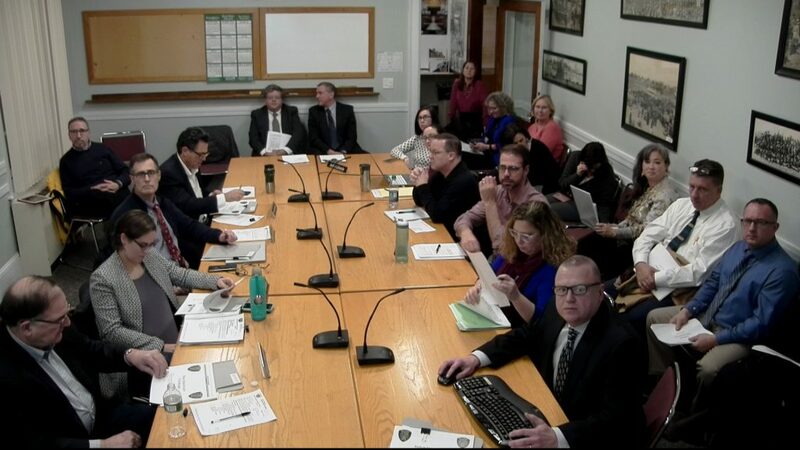 The Select Board continued its budget process on Wednesday, December 5 by listening to presentations from four town government departments, the Reading Public Library, Fire and EMS, Police and Dispatch along with the Reading Coalition Against Substance Abuse, and Facilities. Amy Lannon, Director of the Reading Public Library, made the first presentation. Lannon reported that the past year has seen a forty-two percent increase in programs with a twenty-five percent increase in attendance at those programs in the library. Meeting room use is up twelve percent. Currently, there are over 22,000 persons in town who hold library cards, which is up four percent. Lannon attributed much of the library’s success to her staff and the excellent inter-departmental cooperation found in Reading. The library’s budget request includes the addition of a fifteen-hour communications specialist and a reclassification of the division heads from grade G to grade H, for the purpose of encouraging career advancement, which is linked to retention. Lannon concluded by reporting that the town’s annual investment of $1.5 million returns a $6.5 million benefit to the community. Fire Chief Greg Burns reported on the progress being made to hire the additional firefighters authorized by the override funds. Once a new firefighter is hired, there is a six-month wait for placement in the Academy, which is one reason there has been a lag in hiring. One new hire will be going to the Academy in April, with four slots for Reading new hires being saved for May. In 2018 the fire department responded to 3,780 fire calls, 2,184 EMS calls, and has performed twenty-two Narcan administrations. All Reading firefighters are also paramedics and each ladder truck is also outfitted as an ambulance. The presentation for the police department and dispatch was given by Police Chief Mark Segalla. The department has made all of its override related hires and currently has forty-six officers on the streets, with two at the academy. The second school resource officer was hired in July and has been in the schools the entire school year. Segalla also reported that a new police car would likely be needed in 2020. Reading’s ten cruisers are on the streets twenty-four hours a day seven days a week, “and those are hard miles,” Select Board member Dan Ensminger observed. Both the number of calls and the number of arrests are on the rise, though overdoses are down. The number of domestic disturbances is on the rise as well. The extra officers have allowed for more “proactive policing” including foot patrols in the downtown and officers observing behaviors and patterns at traffic trouble spots around town. 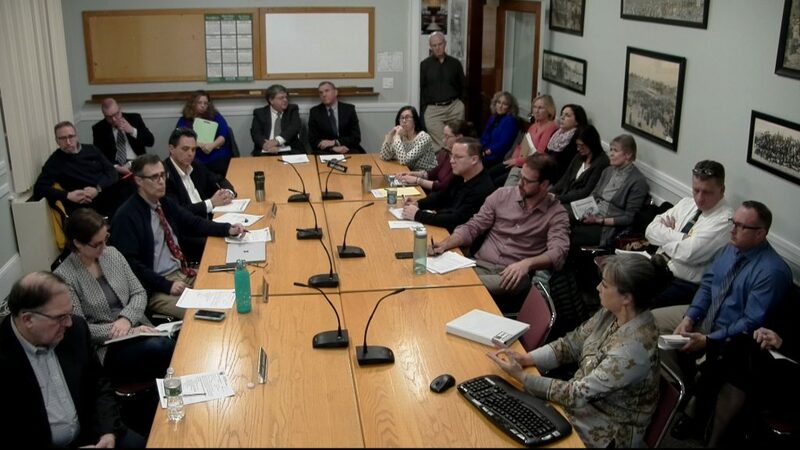 The Reading Coalition Against Substance Abuse (RCASA) is in year ten of a ten-year grant and will require funding from the town government in order to continue in 2020. RCASA Director Erica McNamara requested a budget of $150,000 for the program which includes an executive director and a part-time outreach coordinator. Since RCASA’s inception, there has been a twelve percent decrease in underage drinking in town. McNamara reported this as a positive result as it is often drinking that leads to abuse of other substances. Towns with active coalitions normally have a five to fifteen percent lower rate of substance use than towns who do not have a coalition. One hundred and seventy residents were connected this past year to mental health services through Interface, a service open to all residents to help link them with qualified mental health professionals. RCASA has secured over $1.6 million in grants over the ten years and will continue to seek outside grants, once the ten-year federal grant has ended. Joe Huggins, Facilities Director, was the final presentation of the evening. His department maintains and cleans seventeen locations in town, including the eight schools. They service around 2,600 work orders annually, seventy-three percent of which are accomplished in-house. Huggins is requesting a four and four-tenths percent increase in funds. The increase is primarily driven by increases in minimum wage laws affecting cleaning contractors whose costs have risen as much as fifteen percent as well as costs in maintaining the turf fields. The Select Board adjourned at 10:00 pm.